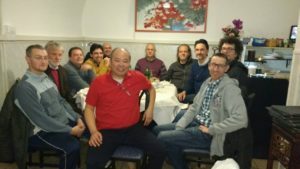 The Linux User Group Bolzano-Bozen-Bulsan is a South Tyrolean association which celebrated 15 years of existence in January 2016. Considering the documents it is not entirely clear if the foundation took place on 16. January (atto-costitutivo) or 22. (vorstellung_de). 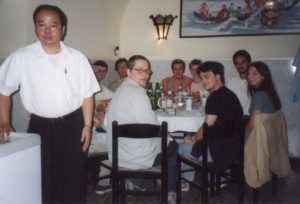 The founding members in 2001 were Josef Astner, Paolo Dongilli, Patrick Ohnewein, Paolo Pierobon, Simon Santoro, Martin Schweitzer, Franz Verdorfer and Michael von Guggenberg. Times have changed, but three of them are still active: Paolo Dongilli, Patrick Ohnewein and Paolo Pierobon. Paolo Dongilli, back in the nineties engineering student at the University of Padua, worked with Sun Solaris-based workstations. He got in contact with the local Linux User Group PLUTO (original definition: “Padova Linux Users”) which allowed him to run free software for the first time. Consequently he became fan of GNU/Linux and promised himself to form a similar group of interest in his hometown Bolzano-Bozen. 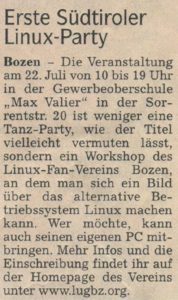 Patrick Ohnewein, at the time a Java engineer in a small software house in Überetsch was likewise an impassioned local GNU/Linux pioneer. How many times he needed to rebuild his OS kernel to make some particular component work? Most probably he cannot give an answer ;). Fact is that he registered himself to the project LinuxCounter and found the contacts of like-minded hackers, among them Paolo Dongilli. They met together and so Patrick, Paolo and others decided to found a local “GNU/Linux Stammtisch”, which later became our current association. Patrick was elected as its first president. The group, at the time young (aged between 20 – 40) was very active. 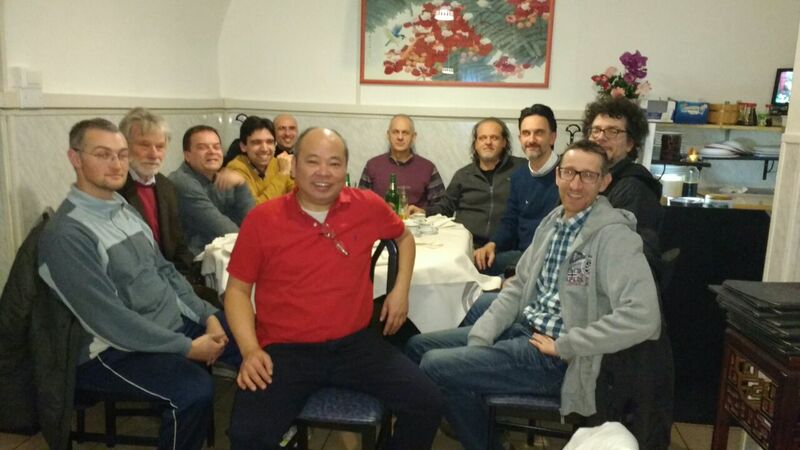 Regular meetings in the Chinese restaurant “Drago d’Oro” (Rauschertorgasse/Via della Roggia, Bz) took place. 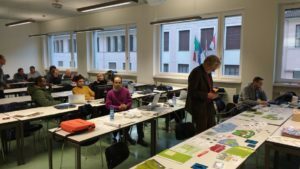 On of the most important goals became the organisation of the Linux Day, later renamed into SFSCon and now in the hands of IDM Südtirol – Alto Adige (ex TIS innovation park). 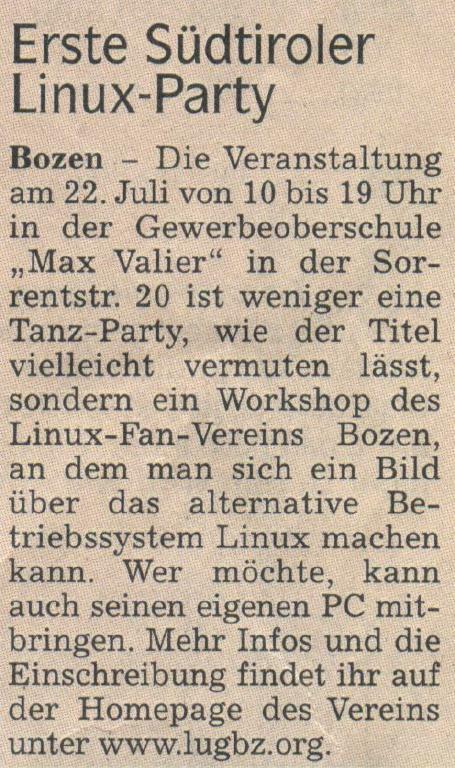 Another key aspect lied in the numerous “GNU/Linux Installation Parties” hold at the “Gewerbeoberschule” (now “Technologische Fachoberschule”) “Max Valier” in Bolzano. Side by side to the detailed explanations by school’s teaching assistant and LUG member Karl Lunger, the amazing maker works by Andreas Kofler, the diagnosis of both hardware and software problems on plenty of computers brought by the participants and long-lasting kernel compilations, it was a lot of fun. Another highlight was Paolo’s wedding with the Tux cravat and the Windows-free fence raised by his LUG friends 😉 . Other spare time activities included barbecuing “Fredi’s Grillfest” and slitting “Pinguine im Schnee”. Patrick decided to change employer and left the firm in Überetsch. Together with colleagues he founded CoCOS (“Competence Center OpenSource”) to work full-time on and for FLOSS solutions for the South Tyrolean industry. This was also the moment to take over the SFSCon organisation to sustain the increasing challenges (personnel, finances) which had brought the LUG in difficulties. Later CoCOS was merged with TIS innovation park’s electronic engineering unit to become the “Free Software & Open Technologies” center. Patrick retired as president and Daniele Gobbetti (“peer internet solutions”) became his successor. The pizzeria “Gambrinus” (Via Locatelli-Str., Bz) was chosen as the new main venue for meet ups. Chris Mair (1006.org) was the LUG responsible for holding courses about programming languages (Python, Perl) and all kinds of free software products ranging from PostgreSQL, Samba and even BSD. Some courses were targeted to a specific audience, like “Free Software for Free Women” held by EURAC researcher Judith Knapp. Finally we as LUG were and are always committed to the raise of awareness about free software and open source solutions in the public administration’s sector. Our numerous attempts are documented in the Open Letters section on this website. A successful example for a local public entity making extensive use of FLOSS is the “Gemeindenverband/Consorzio comuni” which maintains the whole IT infrastructure of the municipalities. In the 2010s the LUG enters a reorganisation phase under Shaun Schutte’s responsibility (the new president). Old concepts needed to be rethought and program changes had to be enacted. In 2016 the LUG resumes the organisation of workshops, among them also in cooperation with other local organisations as the radio-amateur association (“Il radioascolto con i computer”) and the Italian school authority (“FUSS nelle scuole”, “FUSS: creare un’aula informatica a basso costo con Raspberry Pi”). The latter collaboration has been and continues to be of particular interest, since literally all South Tyrolean schools with Italian as primary teaching language adopt a special GNU/Linux distribution as the operating system on the teacher and student PCs: FUSS (“Free Upgrade South Tyrol Schools”). Finally still in 2016 LUG founder Paolo Dongilli, promoter of these initiatives, took over the FUSS project coordination as full-time employee. At the same time a bunch of club members got in contact with the local Green party to reflect on long-lasting strategies to overcome repeating vendor lock-in scenarios in the public administration but also in general (consider Microsoft, Oracle, SAP etc.). This step led to the birth of the “Digital Sustainability” movement directed by Anton Auer (www.openbz.eu), which has organised meet-ups with like-minded people also outside of the province’s borders. The first big achievement of this group consists in the opening of a Open & Linux counter, where people twice a month get free help on installing and using FLOSS software. So stay tuned!